Banner ads are everywhere, but do they still work? If you're interested in the podcast on this topic, scroll to the bottom of this post. With the rise of social advertising and conversion conversations many people skip over the humble display banner ads as though they are no more than a has been. Tossed to the cutting room floor they were thought to have outlived their usefulness. Many people run to Facebook and Instagram ads and don’t even think about the first digital ad unit. Although it’s seen some ups and downs, the banner ad unit is still alive and I want to share four points on why it should be in your marketing mix. There is no doubt that you can buy a lot of impressions for a buck. This is great because there are times that you need to soften the market before a product launch, or build awareness before a big conversion push. Being able to spend a little money and get a large spread of display ads means you will be able to start getting in people’s minds before they are approached with your special promotion or big product introduction. This is also great because you can start to collect a lot of data. Determining ideal target markets, audience segments, and geographies with a cheap ad unit gives you flexibility to broaden your reach without wasting money. In a world of “targeting targeting targeting” this tactic gives more flexibility to gather broad based data while still staying within master targeting metrics. Not to say that you can’t get highly targeted with banner ads, because you can. But it is an affordable way to broaden the target to build more data points so your targeting can be better on future campaigns! “I don’t need display ads because everyone converts from my keyword advertising!” Have you ever heard that phrase, or maybe you’re someone who says it. 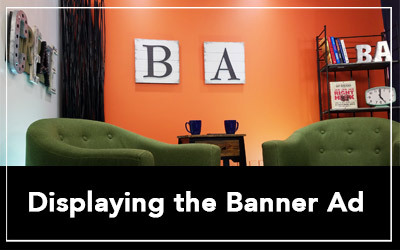 A recent study conducted with Center for Marketing and Opinion Research and JMC Brands discovered that while only 18.4% of high school juniors and seniors will click on a banner ad, 24% will search for information after seeing a banner ad that sparks their interest. That means that your keywords strategy is amplified by your display banner campaign even if the person doesn’t click on the banner ad itself. In his book “Successful Advertising” Thomas Smith describes that a buyer needs to see an ad roughly 20 times before they are willing to actually make a purchase. He states that it takes 5 times of seeing an ad before someone will actually stop and read it for the first time… and that book was first published in 1885! Today it is even more true with banner blindness and the amount of ads we are inundated with every single waking moment of the day. So using a display campaign is a great way to soften that target and get your ad in front of people several times for a small investment and start chipping away at those 20 views. In 2018 the technology that is driving display advertising is revolutionary compared to the first banner ad that “popped up” in the mid 90s. Display campaigns can now target so precisely that there is no reason to feel like it’s a shotgun approach as it might have been in the past. At JMC Brands we can target as broadly as an entire DMA and all ages and genders, or we can place an ad within 15 feet of an address and serve ads to a specific gender, household income, and even a favorite sports team! But the real technology comes in the form of machine learning and programmatic placements, The computers are smart enough to know which ad is performing better. They are smart enough to prioritize sites that get better conversions. They are even smart enough to display ads that are relevant to the text on a webpage. However, one thing that makes JMC Brands unique is that we don’t set it and forget it and let the computers do their magic. We look at our campaigns every day to make sure they are performing at maximum efficiency and more importantly that they are generating the highest click through rate possible. Because advertising is an art and a science. So let the computers figure out the science, but let the people create the fine art. All of this combined makes display advertising a powerful tactic still in 2018 and should be considered when putting a marketing plan together. Whether you want to soften your market, collect data to make your campaigns more effective, or leverage the state of the art technology to advertise your product or service, Display Banner Ads are still alive and kicking and have a LOT to offer. Follow the Business Acumen podcast on Soundcloud.